Garage insurance is the most overlooked type of coverage that is available. Most people ignore it at their own peril because they believe it is covered as part of their homeowners coverage. And it is — up to a point! If your garage is detached from your home it is considered an outbuilding on your homeowners coverage and is often insured for a percentage of the coverage on your home which may not be adequate if you have a deluxe man-cave full of expensive tools, toys, and equipment. If it is attached to your home and made-over in deluxe-mode with cabinets, special lighting, expensive floor and wall finishes and filled with $40,000 worth of shop tools and equipment — you may learn too late that you are grossly underinsured. The days are long gone when a garage contained simply a space for a few garden tools and the family sedan. 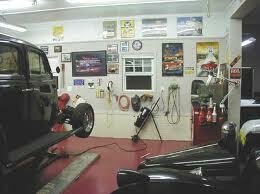 Many garages today are used as hobby shops, classic-car laboratories, wood working shops, etc. In most cases, the accumulation over the years of tools and specialty equipment related to these shop activities has a value sometimes far in excess of the garage structure containing them. Since they are accumulated piece-meal over time, the total value is often obscured by time itself. Most garage owners lack adequate insurance coverage in the areas of casualty, contents, and liability coverage. The way to protect yourself and your property from a disastrous loss is to do an audit on the coverage that you currently have versus an inventory of the replacement value of all garage related property you currently own. Keep in mind that when it comes to a claim — you will be saddled with the burden of proof concerning the amount of loss you have incurred. ◆ Photo of the tool or piece of equipment. ◆ Description of the tool or piece of equipment. ◆ Brand name and model number of the tool or piece of equipment. ◆ Serial number (if any) of the tool or piece of equipment. ◆ Current replacement cost of the tool or piece of equipment. Next, make a photographic inventory record of every wall and portion of your garage from as many different vantage points as is necessary to describe your garage environment in picture format. If your garage is detached (outbuilding) make a photograph of every wall elevation of the exterior structure and some general perspective shots from various angles. You want to be able to document to a third-party what your garage consisted of, if and when a disaster strikes. Photos of the remnants of a foundation after the superstructure is gone, won't cut it. Neither will your verbal description of — what was there. Insurance companies rarely trust the insured when it comes to the extent of the damage. Be prepared to prove it beyond a shadow of a doubt! Next, document the current replacement cost for your garage superstructure should it be totally destroyed. A close estimate is sufficient for this since construction costs always rise over time and vary greatly geographically. Once you have the above accomplished you should have a very close idea of the cost to replace your personal property and garage structure should disaster strike. With your inventory in hand you will now want to compare your current coverage with what it will take to replace your personal property and garage. You should start this process by reading the declaration sheet of your current policy and the policy itself. If you get lost in the language of the policy you should sit down with your agent and relate your concerns to him/her about your garage coverage showing them the amounts needed for replacement cost from your inventory exercise you have completed. Request that they explain in clear language your current coverage and how it relates to your exposure to loss. You may learn that you are grossly underinsured and that you will need additional coverage to fully protect yourself. We will also be talking about liability insurance and how it can greatly effect your exposure to loss if an accident happens to a friend, relative, neighbor or stranger while in, entering, or exiting your garage. For more information read our pages: Garage Property Coverage, Garage Liability Coverage, Garage Keepers Coverage, Cheap Insurance, Workers Compensation Coverage, Claims. The Best Coverage And Settlements? Do you have some insight into insurance policies that cover garages? Share it with our readers. Tell us what you know and how to approach getting the biggest insurance-bang for the buck! Tell us of your experience with insurance adjusters and how your claims got settled. If you have photos or graphics that are relative to your story, feel free to upload them.